Several segments that normally decline this time of year are actually up! Unusual for October, the Scooters, Dual Sports, and Street Bikes are up. The amounts are very small, but any increase in the road-going segments this time of year is noteworthy. More normal for the season, the off-road segments are up slightly this month, with the Off-Road bikes having the largest increase at 0.5%. 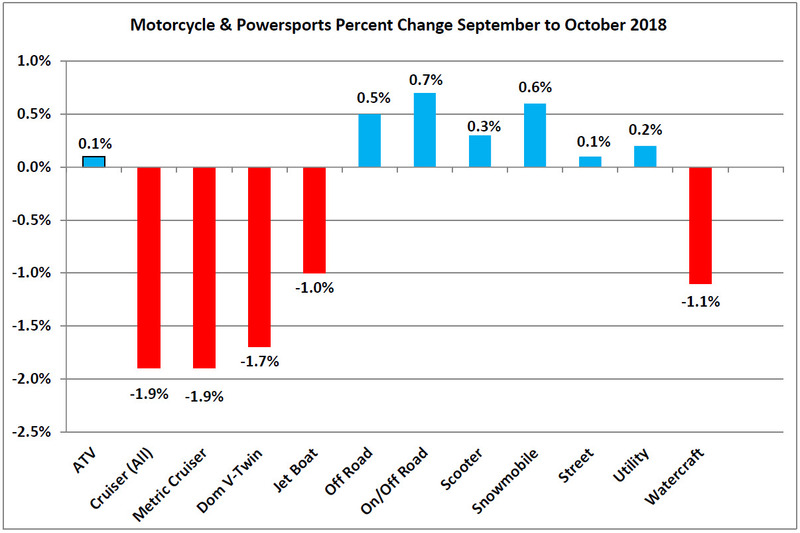 The Cruiser segment is the only one of the on-road bike classes to see a “normal” drop this month, down by roughly 2%. Within the segment, the domestic models are down a touch less than the metrics. Snowmobiles have finally started to appreciate, as we are seeing auction volumes start to slowly increase from their minimal summer levels, raising average prices by 0.6%.